How should one address the Holocaust from the distance of seven decades and in a contemporary urban context? We believe the answer lies in linking the lost and the existing, the absent and the present, and creating a memorable site for commemoration allowing leisure urban activity. 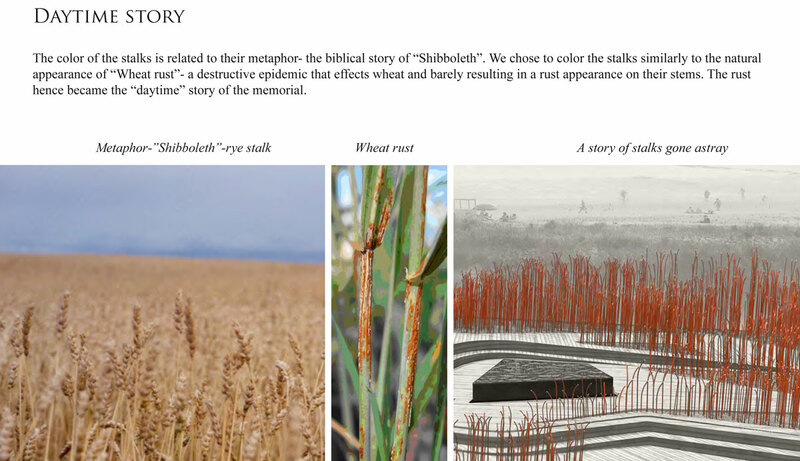 The rust-like light stalks -“Shibbolim” (“Rye stalks” in Hebrew) refer to the biblical story of Shibboleth (Judges 12, 5-6) which has become a synonym for hatred on an ethnic or cultural base. The stalks rise to various heights, sway gently in the wind, and produce soft flute-like sounds. They serve as eternal lights- commemorating the loss of millions, yet emphasizing the absence of numerous indivisuals. Their collective presence, motion and sound create the effect of an absent-present crowd which has gathered to testify and tell a tragic story. 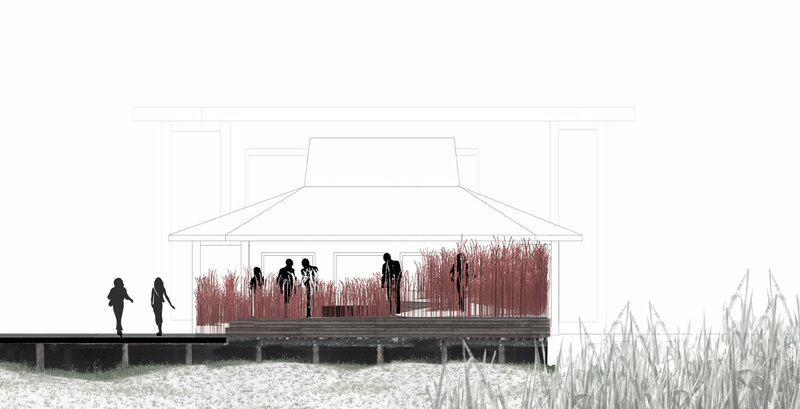 Working with a slight rise of the wooden deck, the stalks form an urban garden facing the boardwalk. 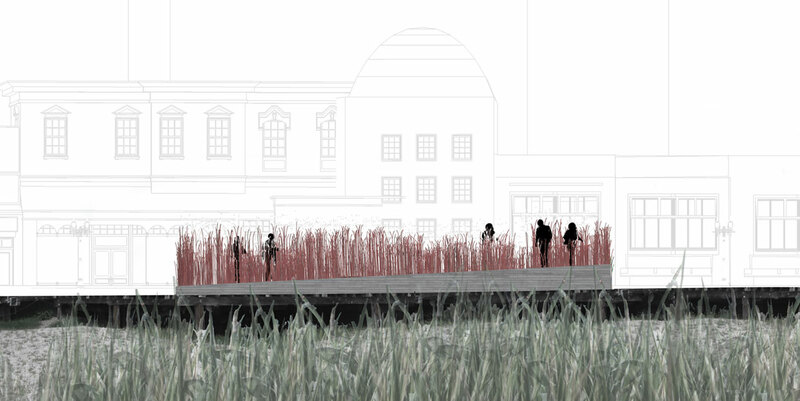 They also relate to the see grass situated between the boardwalk and the ocean. The contrast between the two somehow blurs the distinction between natural and artificial, life and still-life, present and memory. 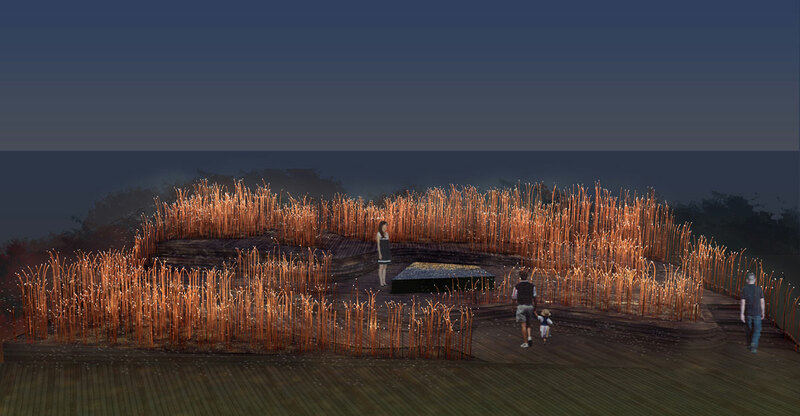 A low reflecting-pool at the center of the memorial creates a focal point for gathering, holding ceremonies and laying pebbles as an act of grief. 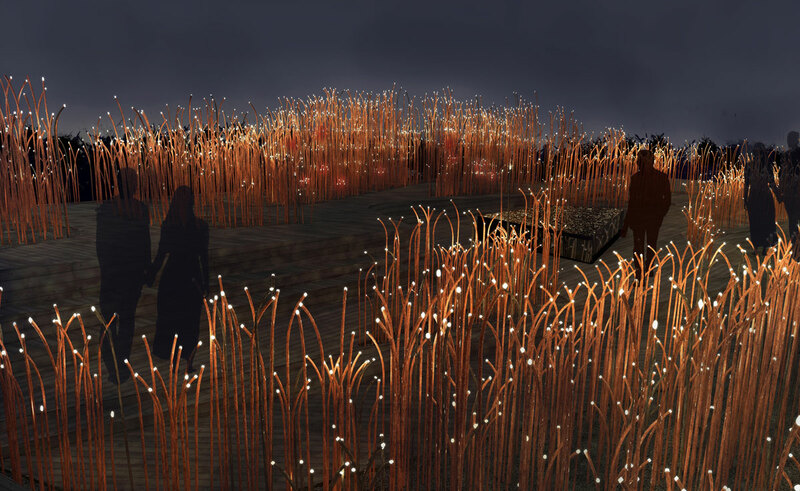 It reflects the visitors during the day, and the stalks during the night. 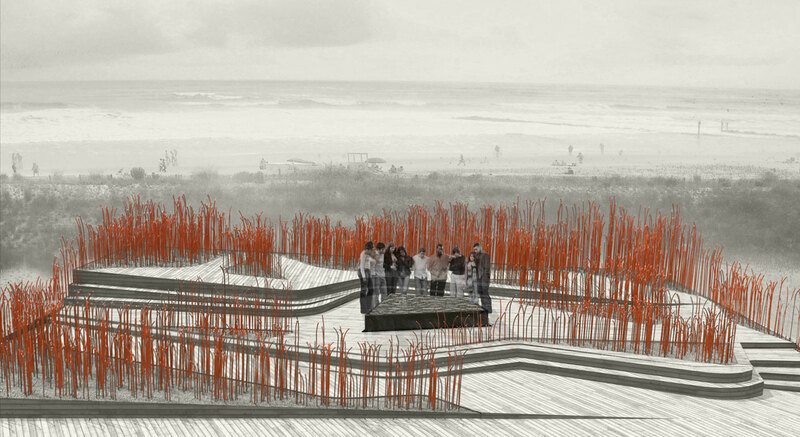 Rather than facing the ocean, the memorial turns its focus to the city and its people. 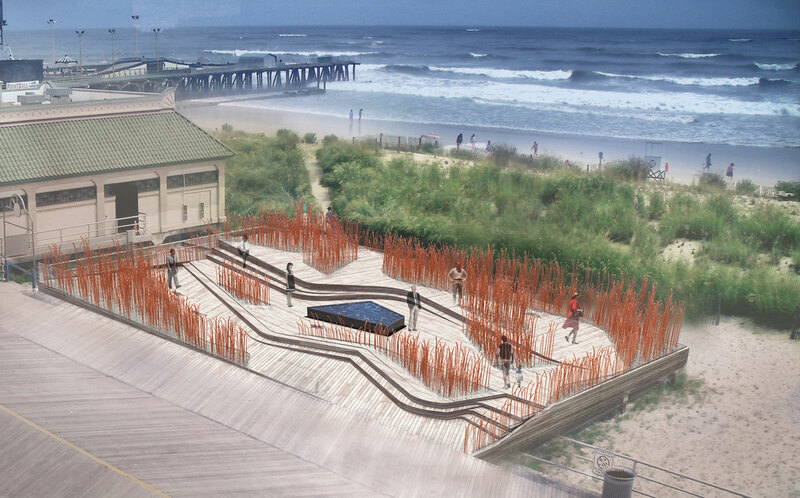 Situating the seating and gathering areas to face the boardwalk, further accentuates the message that memory and grief are inseparable from life, and that the best way to commemorate loss is binding it with the present. 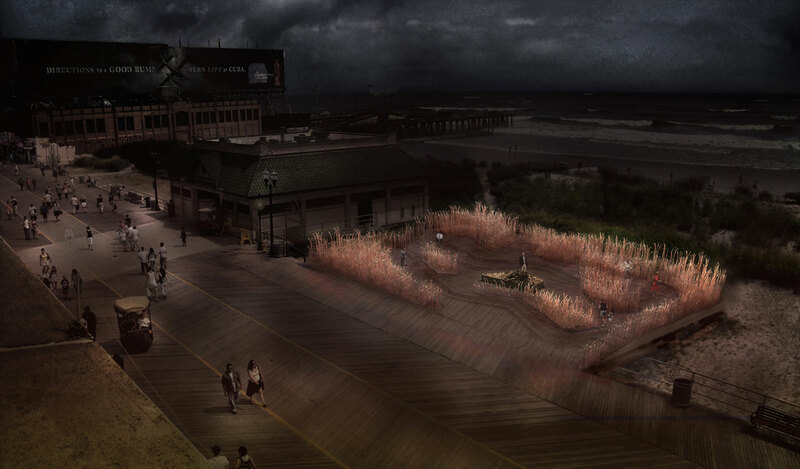 The Atlantic City Holocaust Memorial Board held an open international competition for selecting a design for the city’s prominent boardwalk. 712 proposals have been submitted from 55 countries. These have been shortlisted to 13 finalists, then narrowed down to 6, and finally 2 finalists were invited for an additional round. SAYA’s proposal- one of the top two finalists, was eventually awarded a second prize. The distinguished jury included: Daniel Libeskind, Richard Meier, Michael Berenbaum, Clifford Chanin, Wendy Evans Joseph, and James E. Young.